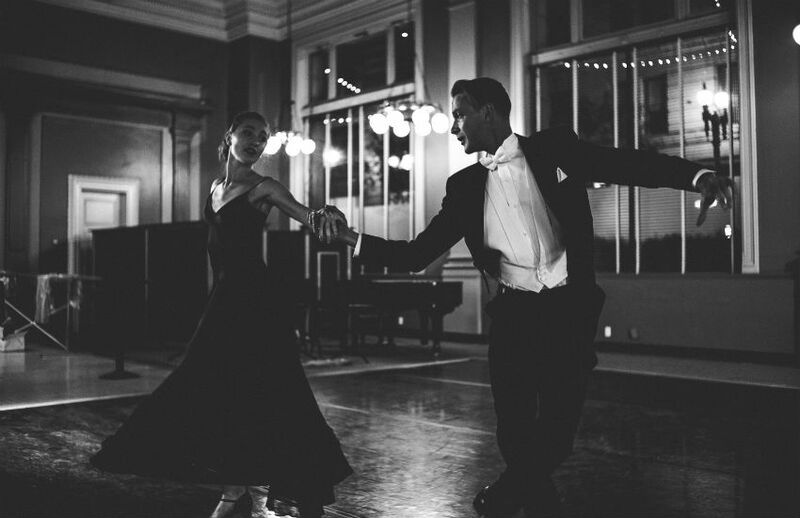 For part two of its DANCE+DESIGN series this season, American Contemporary Ballet is returning to the Gensler architecture offices downtown for a celebration of Hollywood icons Fred Astaire and Ginger Rogers. The program on May 2 and 3, “The Language of Dance: The Eloquence of Astaire,” focuses on the power of partnering and features “two of Astaire’s best” pieces, says artistic director Lincoln Jones: “Smoke Gets in Your Eyes,” from the 1935 film Roberta, and “Never Gonna Dance/The Way You Look,” from 1936’s Swing Time. Dancers Zsolt Banki, Cleo Magill, and Rochelle Chang will re-create the famous duo’s seductive moves, accompanied by live music as Jones explains the choreographic elements behind the glamour. A two-story wall of glass overlooking the Central Library serves as the backdrop, and a reception afterward encourages the audience to meet the artists—all part of an effort to break down barriers in a casual, nontraditional performance setting. We asked Jones for a sneak peek. Get ready to sway and swoon. Why is the Fred Astaire/Ginger Rogers pairing so significant in the world of dance? Why are they so compelling to watch? Among other things, their partnership is significant because they did so many films together. Astaire is a major artist as both a dancer and a choreographer, and if you were to divide his output into periods, almost all of his early work was done with Rogers. When you consider that he tailored his choreography to his partners, she becomes a major influence. How do you translate the Astaire-Rogers connection to your dancers? How does their ballet training come into play during ballroom dance? The ballet training definitely helps. Despite the fact that he didn’t have much ballet training, Astaire was very balletic. As for how we translate the overall feeling of the duo to the dancers, we start with the rhythm. Astaire’s rhythm was just about perfect, so we start with that precision, which communicates a great deal of the style. From there we strive for a really high level of accuracy with the other musical qualities, like the phrasing, and also the way the arms, hands, and heads move. A lot of Ginger Rogers’s personality comes through how she moves her left shoulder. Cleo Magill is particularly good at assimilating these kinds of details. Of course, the suit doesn’t entirely make the man, but in this case it really helps. Astaire was so musical that by assimilating these movements, it kind of imbues some of his overall musicality to the dancer. But the dancers are obviously personally affected by the music as well. What will we see in these pieces, and why did you select them in particular to showcase Astaire’s work? “Smoke” begins very slowly and sensually, but in the middle of the dance it has one of the fastest and most exciting passages in Astaire’s career. “Never Gonna Dance” begins melancholically but builds steadily into ecstasy. Both are danced to beautiful tunes by Jerome Kern. One reason these dances work well together for our program is that they contrast each other on one important point: In “Smoke” he’s gotten the girl, and the dance is a kind of celebration of their love. But in “Never Gonna Dance” he is losing her and doing everything he can to win her back. It’s a great example of how Astaire was able to serve the overall plot of the film with a dance.